When Joseph Rawnsley created the pattern of Chief Joseph blanket featuring repeating blocks of colourful shapes 100 years ago, he probably would have no idea that today his design would cover everything from laptop cases to designer shoes. Rawnsley also could not have understood the magnitude of that pattern’s relevance today. The blankets by the company were embraced by Indigenous populations because they were needed as items of clothing and looked better than the multi-stripe variety of the Hudson’s Bay Company, not because of any other special significance in their pattern. But, over time the pattern has come to be associated with Indigenous identity. Rawsley was an expert at the Jacquard loom after graduating from the Philadelphia Textile School. He spent time on Native reserves. while researching the blanket and he was influenced by Navajo patterns but combined those with geometrical shapes from oriental and European designs. Still, seeing this imagery as “fashion trends” a few years ago when Pendleton released collaborations with retailers including Levi’s, Opening Ceremony, and Vans irked Indigenous communities online, who believed that looking as the design pattern as a fashion trend would mean at some point, their culture could be seen as a passing fad. Colours, patterns and imagery do have particular significance to some Indigenous people (and signify different things to different people), often reflecting on traditional ceremonies of nations. “It’s a very personal decision to receive [your colours] and for some people, they don’t feel ready until they are older. For others, they are raised in the culture and they receive it when they’re younger. I didn’t receive mine until I was 21, almost 22 years old,” said Jamie Lee Morin, a Métis woman and community outreach coordinator at Ryerson University. 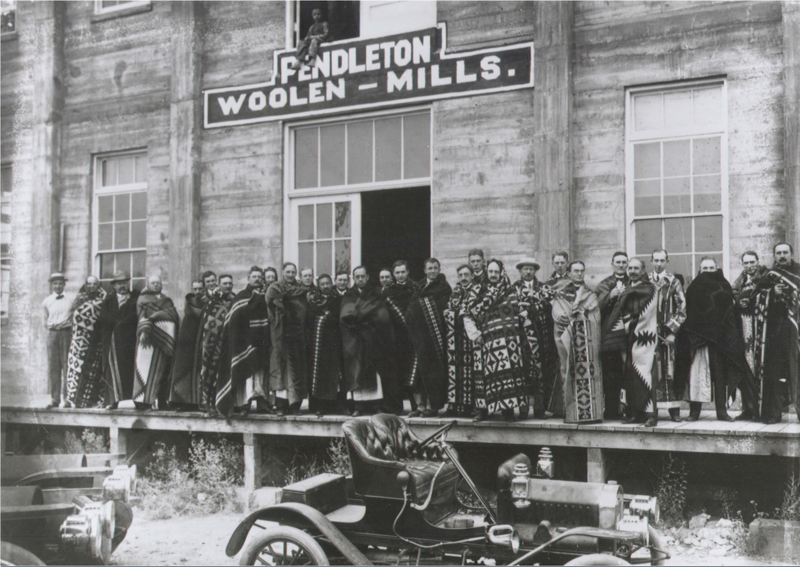 While Pendleton does collaborate with Indigenous artists, it remains owned and operated by the non-Indigenous Bishop family, profiting from Indigenous and non-Indigenous customers. In 2016, Pendleton officially entered the Canadian market by collaborating with Indigenous-owned and operated Manitobah Mukluks, run by Sean McCormick. In the past, the company appeared in Canada through their e-commerce site and special displays at stores like Holt Renfrew. “We sought out a partnership with Pendleton because we saw an amazing potential for selling their products and sharing their story in Canada,” said Tara Barnes, the Director of Brand Development of Manitobah Mukluks, in an email. “Our philosophy is to welcome all feet that want to walk with us. Mukluks and moccasins are some of the most practical footwear for Canadian landscapes and weather – they have kept Sean’s people alive for thousands of years!” said Barnes. Like mukluks and moccasins, blankets are not considered sacred symbols such as headdresses. So the company welcomes all people to purchase their footwear and also encourages people to also support other Indigenous designers trying to make a living from their art and culture.